Esaias Reusner Junior is regarded as the first prominent German master of the lute suite. Although his musical language was very much influenced by the prevalent French style (he adopted the French style brisé and placed a prélude non mesuré at the beginning of some of his suites), it also deviated from it. His music can be described as an attempt to combine the elegance of the French style with a more colourful harmonic language and a clear taste for the cantabile. But what does Reusner have in common with the Accords Nouveaux? At the time of Esaias Reusner the Younger, Accords Nouveaux were certainly no longer seen as a new phenomenon. Experiments with the tuning of the lute had started back in the 1630s at the initiative of several French lutenists. Esaias Reusner Junior probably knew the works written in Accords Extraordinaires or Accords Nouveaux by his French predecessors. But his reasoning for changing the tuning of the lute must have been more than merely to emulate his models, because the standard D minor tuning system had already been well established in his time. Experience shows that the resonance and, therefore, the sound colour of the lute are clearly dependent on the type of tuning used. It would appear that Reusner purposely exploited the expressive possibilities of these new colours. 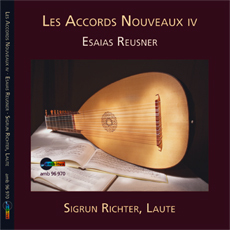 This recording, the fourth volume in the series “Les Accords Nouveaux” by Sigrun Richter, presents side by side the different facets of Reusner's creative output. We experience the effect of the scordatura with the Suite in D minor, the very key for which the D minor tuning system (A-d-f-a-d’-f') was originally intended. In this modified scordatura (A-d-f-a-c‘-e‘), the music sounds restrained, almost oppressed. A much warmer and fuller sound is produced by the tuning in Bb-d-f-a-d'-f in the Suite in B flat major. Also present on this recording are two suites written in the nouvel accord ordinaire: the melancholy Suite in G minor and the flamboyant Suite in D major with its magnificent Passacaglia. The often dark and profound character of the Suite in A minor is emphasised by Reusner's peculiar use of the lute's low register. This CD shows that Reusner uses scordatura and the different registers of the lute to intensify the expressivity of his music through particular tonal colours.